Guam Sports Events, along with Gold Sponsors Guam Visitors Bureau, Pacific Islands Club Guam and United Airlines, announced today at a lively beach themed press conference the exciting additions and new traditions to this year’s Guam International Marathon festivities. The press conference gathered thought leaders from the tourism industry -- Jon Nathan Denight, General Manager of GVB and Sam Shinohara, United’s Managing Director Operations for Guam and Micronesia – to join GSE Managing Director Ben Ferguson in insightful discussion about the overall economic impact, earned exposure and benefits to Guam from this international sports event. 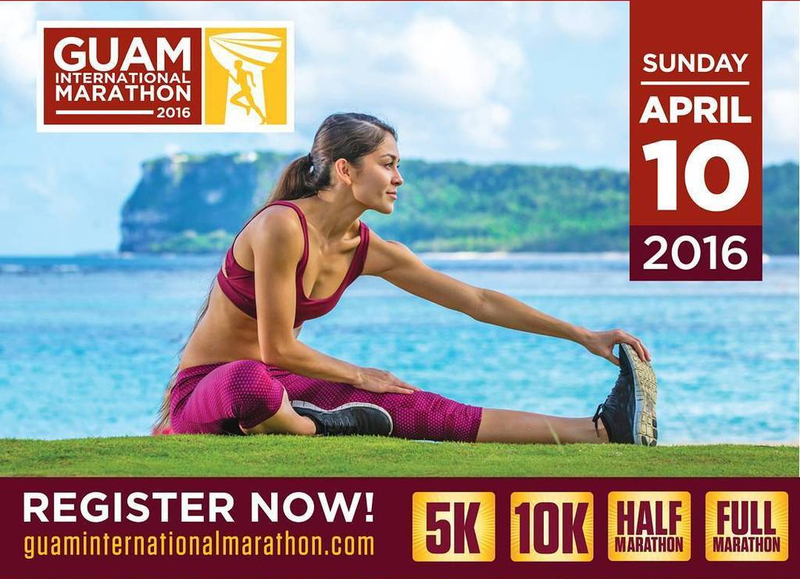 The Fourth Annual 2016 Guam International Marathon – with 5K, 10K, Half Marathon and Full Marathon races – scheduled for Sunday, April 10th, attracts runners from all over the world for three days of festivities. On April 8 and 9 the GIM Expo will take place at the Pacific Islands Club and serves as the convenient and festive race participant packet pick up location. The Expo is open to runners as well as the general public to enjoy a running clinic by 2000 Sydney Games Olympic gold medalist and GIM Ambassador, Naoko Takahashi, sponsor booths, live entertainment, cultural activities, local and international food concessions, as well as shop for official event and running merchandise. This year, GIM organizers have added new starting line festivities to include entertainment, music, a light show, cultural performances and a surprise to be revealed on race day. Along the race course, aid stations will be found at every one-mile increment with fiesta stations, cheering stations, live entertainment, DJs and cooling stations interspersed throughout the courses. What Ferguson is referring to is the new GIM tradition called the GIM Dip. Runners are encouraged after they cross the finish line to follow the red carpet to the beach where they can take off their shoes and give their well deserving feet, or tired muscles, a refreshing dip in beautiful Tumon Bay. Event photographers will line the beach to capture this special moment. In keeping with its beach focus, the all new Finishers’ Beach Party will take place beachside at Governor Joseph A. Flores Memorial Park (Ypao Beach). Food, drinks, entertainment, and prize giveaways are planned alongside the official awards presentation. The Finishers’ Beach Party is open to all participants and the general public. The fourth annual Guam International Marathon 2016 is organized by Guam Sports Events Inc. and will take place on Sunday, April 10, 2016. The 2016 GIM includes 5K, 10K, Half Marathon (13.1 miles) and Marathon (26.2 miles) race distances. All courses have been officially certified by the IAAF (International Association of Athletic Federations) and AIMS (Association of International Marathons and Distance Races). This designation means that marathon runners may use this as a qualifying event for the Boston Marathon. GIM anticipates more than 3,000 local and international participants again this year. Complete event details and registration can be found on the official event website atguaminternationalmarathon.com. Registration is open online at guaminternationalmarathon.com or in person at the Pacific Islands Club’s front desk. Registration ends on April 5th. This year, all finishers will receive a GIM event t-shirt, beach towel, beach mat and a finisher’s medal. Participants are encouraged to follow the event’s social media pages for the latest information and promotions. Ben Ferguson, Managing Director | Guam Sports Events, Inc.